Outstanding grip, traction + skid control on muddy terrain. Extra deep + Extra wide tread. Long life even in difficult conditions. Abrasion + puncture resistant performance. Excellent on dirt roads with anti-stone trapping. 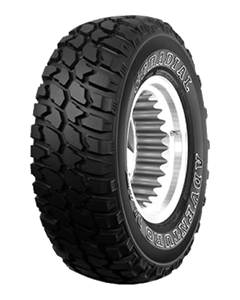 Double + Triple Tread/Sidewall Protection. Once again, excellent service from these guys - had 4 19" tyres fitted and roadforce balanced, on some expensive alloys. They took great care not to mark them and did everything i asked of them. They have a great team there, and it's good to see a female face in the workshop in what is typically a male dominated environment. The service here is always incredible; very professional, swift and very reasonably priced. The staff are all highly skilled and very pleasant. I can't recommend it highly enough! Excellent service and price. Was impressed by the knowledge of the fitter knowing that the best tread/tyre should be on the back of the vehicle to prevent over steer - a fact that many people are not aware of. It was so nice to go to a tyre fitters and find smiling faces who were polite and understanding would definitely use again. Would definitely recommend you talking to Gareth as he is so so helpful. Tyres were available on time and fitted with great care and attention. Recommended!